Dogs are amazing animals and they are great when you pet them. Arguably, dogs are the best pets. In fact, they are one of the most common pets in the world. The history of dogs and human is very old that extends beyond thousands of years. Gone are the days when dogs were only used as for hunting or guarding. Nowadays, dogs became like members of our family. We get them their special foods, we take them to vet and take care of all the aftercare happily. The love of dogs even makes people break their wallet without even thinking twice. Given below is a list of most expensive dogs, not only with a purchase cost but in aftercare too. Saluki is a dog breed which was originated from “Fereile Crescent”. They are long-legged and deep-chested. Salukis are very gentle and they have a very special bond with their owners. They are very independent breeds and they require intensive training in their early days. They are also known as Royal Dog of Egypt.It has been told that they were being our companions since Pharaohs. They are also very great hunters. Back in time, they were used by merchants to hunt rabbits and deer during their travel. They are reserved with strangers but very active and gentle with family members. As they were bred to hunt, they still got a little wild in them, they are little difficult to train. The normal size of Salukis range from 23-28 inches (58-71 cm) and weight can go 40-60 pound (18-27 kg). Females in Saluki are generally little smaller than males. They come in a variety of colors. Their lifespan is somewhere between 12-14 year. Lowchen is a small breed of dog. Lowchen means “Little Lion Dog” in German. Lowchen is considered as a toy dog. They have long hairs but they shed very less as compared to the other dogs. They also have very less allergic effects. They are very happy and friendly by nature. They love to play and they have a very soft heart when they are around with kids. Lowchen can get depressed if left alone for a longer period; they seek human attention and love. They are very intelligent and quite breed. During Medieval France and Germany they were brought up as companions of Royal Families. The weight of these small toy dogs do not exceed more than 8 kg (18 lb), in males the average weight is 5.4-8.1 kg (12-18 lb) and in females, it can be between 4.5-6.8 kg (10-15 lb). The height in Lowchen remains between 30-35.6 cm (12-14 inches). Azawakh is a sighthound dog breed which originated from African Continent. They got a lean body and they are very swift hunter. They were bred to hunt and to guard by the nomadic tribes of Africa especially in the Sahara Desert. They are very fast; they can reach up to the speed of 40mph which is very fast in dog’s world. They develop a very intense bond with their owners and they are a little protective of them. They are extremely gentle with kids and love to play with them. As they were bred in the Sahara Desert, they can live easily even in 100 degrees Fahrenheit. They got a lean yet muscular body. The weight in Male Azawakh can be 20-25kg (44-55 lb) and in females, it can be 15-20 kg (33-44 lb), the height in Azawakh can go up to 74 cm (29 inches) in Males and up to 70 cm (28 inches) in females. Akita is a large breed of dog. They originated from Japan, specifically the mountain ranges of northern Japan. This dog breed is listed in the most expensive dog's list for a good reason. In movie Hachi – A Dog’s Tale, it was Akita Dog Breed who played the main character. After that movie, people fell in love with them and they are quite popular in the United States of America. Akita is powerful and independent dog breed. They might be aloof with strangers but with family, they show their enormous affection. Akita is very reserve with strangers and sometimes they can show territorial aggression. They are not threatening to a stranger but they don’t be friendly. When they are around family they are super gentle and playful. They can be very protective if they see a threatening situation for the family. A mature Adult Akita can measure 26-28 inches (66-71 cm) in height with a weight between 100-130 lb (45-59 kg). In Females the weight can go 70-100lb (32-45 kg) and height can be between 24-26 inches (61-66 cm). Stop guessing with their name. 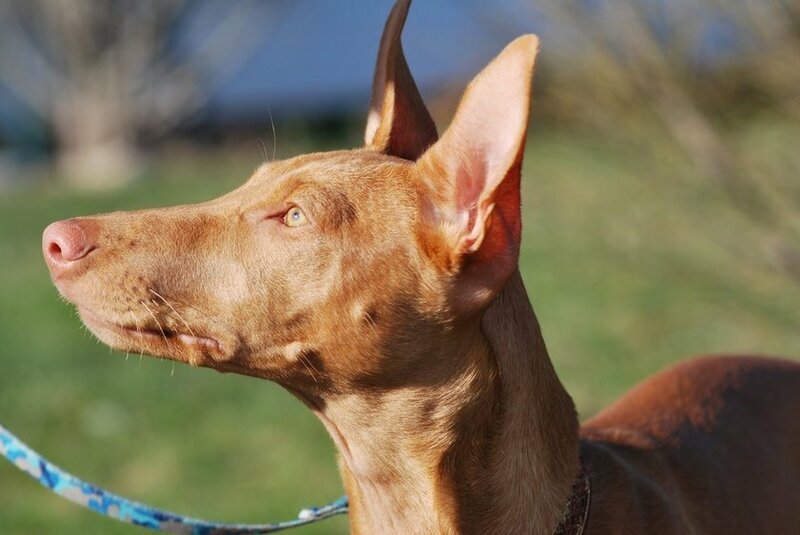 Pharaoh Hound is not an Egyptian breed of dog. They are the national dog of Malta. They were originally bred to hunt rabbits and their native name is “Kelb tal-Fenek” which means “Rabbit Dog”. They are elegant, gentle and very powerful. As they were bred to hunt rabbits, they are also very athletic. They are unique as compared to other dogs, their noses and ears blush when they are happy. They have short and reddish hair coat. As they were bred to be hunters they can be little tough but early training can make them gentle and clam. Pharaoh Hound’s weight can go anywhere from 45-55 pound on average and height is between 23-25 inches. Males are little tall than females. Rottweiler is normally a large or medium-sized dog breed, they were bred in Germany. They were bred to pull carts and herd livestock. They are very powerful and nowadays they are used as rescue dogs by police. They are also very useful in guarding and as guide dogs. They are great in strength and they have enormous power this is the reason why they are being used as guard dogs. They are intelligent and fearless. They need to give a proper training in early age.They can be aggressive and protective of their territory if not trained properly. A trained Rottweiler is gentle and friendly. They are also very calm with kids and understand them. They are large and Males can weight 50-60 kg (110-130 lb) while females have 35-48 kg (77-106 lb) weight range. The height in Rottweiler is generally between 50-69 cm (22-27 inches) in both male and female. Tibetan Mastiff, this world’s most expensive dog is originated from Tibet. They are also very common in China, Mongolia, Nepal, and India. It is a very old breed of dog, considered ancient among all the dog breeds. They are used to protect sheep from leopard, bears and other predators. They are widely used by nomadic people in Tibet and Ladakh. They are very intelligent dogs and as they are used as flock guarding dogs, they use barking and scent marking parameters to keep the flock in line. They are big dogs who live in cold climate; they are not made for apartments. They are friendly and easy to socialize but they need a lot of exercise and training. They are strong, obedient and very powerful. The life expectancy of Tibetan Mastiff is 12 years. They are big dogs and can reach up to 83 cm (33 inches) in height. The weight is between 45-72 kg (100-160 pounds). English Bull Dog is a medium-sized dog, they are very popular as domestic house dogs. They are muscular heavy dogs with a wrinkly face. Bull Dogs are also one of the most common dogs in the world. In the United States of America, this breed is ranked as the 5th popular dog breed. They are very kind and gentle dogs, they are very good with kids. They get attached to small kids and let them play with their ears and tails. They are great family pets. They are not aggressive but they are courageous and very powerful. An Adult male Bull Dog weight between 45-55 lb (20-25 kg), while adult female weight 45 lb almost (20 kg). Chow Chow is a dog breed originated from Northern China, it is also known as “Fluffy Lion-Dog”. Chow Chow is a powerful, loyal and squarely built dog. Chow Chows are loyal to their master but they are very suspicious of strangers. They are neither too aggressive nor too gentle. Given the training to socialize with people, Chow Chows can be gentle and friendly with strangers coming to the home. They tend to rest a lot, they are not very active. But they need something to kill their boredom. They form a very loyal and deep bond with their owner and family. Sometimes, they will behave little overprotective. Male Chow Chow’s weight lies between 55 to 70 pound (25-32 kg).The weight of female Chow Chow lies between 45 to 60 pound (20-27 kg). The height in Chow Chow is between 17 to 20 inches (43-51 cm). Samoyed is a medium sized Siberian dog. It was bred by the Samoyedic people of Siberia who are nomadic reindeer herders and hence the dog got the name. As it takes the whopping price for purchase, it is considered as the world’s most expensive dog.They bred to help people in herding and pulling a sledge. In Europe, they are known as Bjelkie. They have dense double layer coat which helps them in extremely cold winters of Siberia. Samoyed’s are very friendly and sometimes they are considered as poor guard dogs. They are excellent companions, they love to be around with little kids, they play with them and keep their patients around kids. They are very happy dog often called “Sammir Smile” or “Smiley Dog”. They are very strong dogs with one unique habit, they dig when they are bored. So if you don’t want your backyard full of holes, give them some work and keep them busy. The standard size of Samoyed is 21-23.5 inches (53-60 cm) and their weight can reach around 66 lbs. If you own a dog listed in the most expensive dogs in the world, tell about their post care and tell us how adorable they are. We are all ears!